Curious? This is a common question customers have when they visit our store. This article which I am sharing from another website, states the differences quite well. Ready-made and custom-made frames are the two broad types of picture frames sold online and in retail stores. 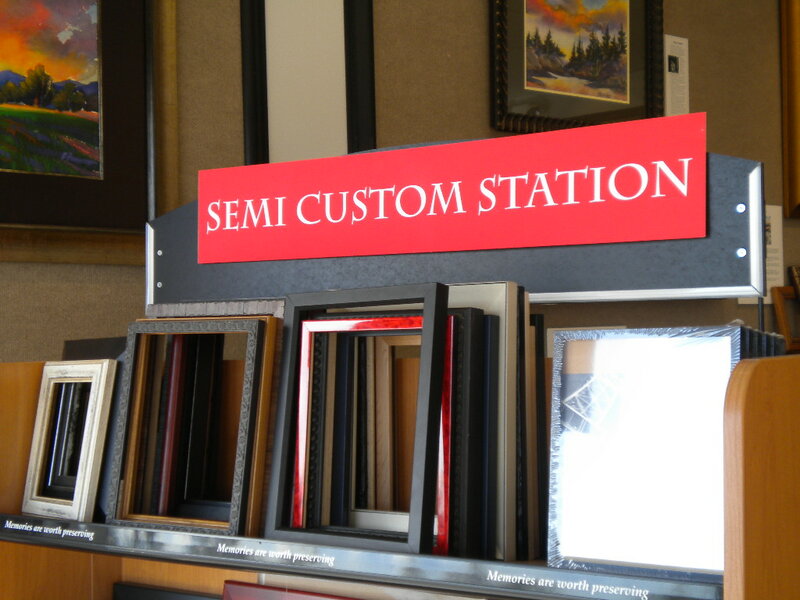 The primary difference between the two is that while ready-made frames are mass produced in standard sizes, custom picture frames are entirely hand-made to each customer’s unique specifications. When beginning any picture framing project, prior to selecting a frame style, choosing a matting color, or selecting a glazing option, a framer must decide upon either a ready-made or custom-made option. This decision does not have a right or a wrong answer. Instead, each frame type will work for different framing projects and the type chosen will be determined by the characteristics of the artwork. Artwork characteristics include the artwork medium, the artwork size, and the overall level of conservation that is desired. Since the framer chooses each component of a custom picture frame individually, every aspect of the framing project can be customized. The choice begins with the frame molding, which can be either of wood or metal, and extends to the glazing, backing, matting, and hardware. Glazing can be purchased in several varieties including non-glare and ultra-violet (UV) light reducing. The backing materials, which are the materials that the artwork is mounted on, are available in standard, acid free, and self-adhesive options. As for matting, not only are there hundreds of colors and conservation grades to choose from, but a custom framing project can use two or more mats to give a truly distinctive look. 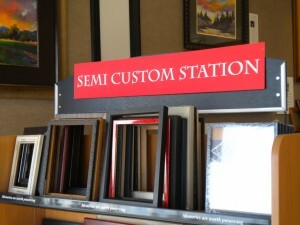 Since they are made to a customer’s unique specifications, custom frames are more expensive than ready-made frames and often require a week or more to make. A custom made picture frame can easily cost over $100. Also, since every part needs to be selected individually, the time required to build a custom picture frame package is quite extensive: it can easily take up to an hour to complete the whole process. Ready-made picture frames are mass produced to one of several standard sizes which are usually the size of photography prints (e.g. 4 x 6, 8 x 10, or 16 x 20). Since they are mass produced, the framer can not change individual framing components. In addition to wood and metal, these frames can be made of several low-cost materials such as plastic and fiberglass. Ready-made frames usually originate from low cost labor countries such as Indonesia or China. The reason they cost so much less than their custom made counterparts is because they are produced in very large batches. As a result, producers take advantage of the resulting economies of scale. Ready made frames range in quality between excellent to very poor. This will depend mostly on the materials used, the precision of the manufacturing equipment employed, and the care taken with packaging and storage. For example, a product purchased at a large retail store, while being inexpensive, will also be of very poor quality and often improperly stored. These frames will be plastic and come with very low glazing and backing options. In contrast, photography and custom framing stores usually come with museum-grade backing and glazing materials, as well as a white mat. The truth is that there is no one-size-fits-all when it comes to frame types. In one project, a ready-made frame will work just fine, while in others a more expensive custom picture frames will be best. It really depends on the framing project in question. As a rule of thumb, a ready-made frame is used when the objects being framed are cut to a standard size and are not precious. Examples of such items include posters and digital photos. While they may have a large sentimental value to the person doing the framing, these items can be reprinted at the click of a mouse button, often in the comfort of one’s home. Custom made picture frames can be used when framing heirloom, semi-precious, or irreplaceable artwork. In addition to accommodating artwork of all sizes, the framer is usually also concerned about the preservation characteristics of the framing materials used. In this case, the goal is to preserve the artwork as much as possible by using acid free materials. Custom framing is also the preferred choice for creating framing projects such as 3D items, or projects that call for elaborate mat designs.